You might expect dung beetles to keep their "noses to the ground," but they are actually incredibly attuned to the sky. A report published in Current Biology shows that even on the darkest of nights, African ball-rolling insects are guided by the soft glow of the Milky Way. When dung beetles roll their tiny balls of poop across the sands of South Africa on a moonless night, they look to the glow of our Milky Way galaxy as a navigational aid, researchers report. "Even on clear, moonless nights, many dung beetles still manage to orientate along straight paths," Marie Dacke, a biologist at Sweden's Lund University, said in a news release. "This led us to suspect that the beetles exploit the starry sky for orientation — a feat that had, to our knowledge, never before been demonstrated in an insect." That's an amazing claim. But what's just as amazing are the lengths to which the researchers went to make their case. First, they built a 10-foot-wide (3-meter-wide) circular arena in a South African game reserve and watched what troops of nocturnal dung beetles did on moonlit nights, moonless nights and cloudy nights. They fitted the bugs with little cardboard caps to block their view of the sky. They even fitted some of the bugs with transparent plastic caps, just to make sure that any differences they saw were due to the sky blockage rather than the presence of the caps. Then the scientists took their dung-beetle arena into the Johannesburg Planetarium and ran the same experiment, to eliminate the possibility that the beetles were using terrestrial landmarks to plot their course in the dark. The planetarium was programmed to show the night sky with the Milky Way, or the Milky Way without the brightest stars in the sky, or the brightest stars without the Milky Way, or just the diffuse glow of the Milky Way with no stars at all. The bottom line was clear: Those bugs could keep track of how the fuzzy streak of the Milky Way was oriented in the sky, to make sure they rolled their balls of dung in a suitably straight line. Why is that so important? Without the proper orientation, the beetles might circle back to the dung pile, where they'd have to face all the other beetles trying to steal away their tiny balls of poop. That would put the bugs' intended meal at risk. "The dung beetles don't care which direction they're going in; they just need to get away from the bun fight at the poo pile," Marcus Byrne of South Africa's University of the Witwatersrand explained in a news release. Dung beetles were fitted with tiny cardboard caps to see how well they could navigate when the night sky was blocked out. When they were wearing the caps, the bugs were more prone to go around in circles. The University of the Witwatersrand's Marcus Byrne discusses dung beetles in a TED talk. Dacke, Byrne and their colleagues describe their latest dung-beetle adventure in this week's issue of Current Biology. Researchers have previously chronicled the bugs' other peculiarities: how the insects do a "dance" on top of their dung balls to get themselves oriented (and keep cool as well) ... how they monitor the sun and the moon for poop-ball navigation ... and how they discriminate between different flavors of dung (the smellier, the better). Byrne said the idea of checking the bugs' celestial compass came up during an earlier series of South African experiments with the bugs. "We were sitting out in Vryburg, and the Milky Way was this massive light source," he recalled. "We thought, they have to be able to use this — they just have to!" The latest experiments show that for the nocturnal beetles (Scarabaeus satyrus), the moon is the most reliable guide. It took about 20 seconds, on average, for the bugs to make their way out of the arena under moonlit conditions. On a moonless, starry night, it took about 40 seconds. But it took three times as long on a cloudy night, or when the bugs were wearing those cardboard caps. The planetarium tests came up with similar results: The bugs were quickest when they could look up at the dome and see the full, starry sky (43 seconds), or even the Milky Way's bright, diffuse band without the stars (53 seconds). When the planetarium dome was totally dark, the average time rose to 120 seconds. Before this study, only birds, humans and seals were known to use the stars for orientation. The compound eyes of a dung beetle may not be all that great — but they're good enough to make out the Milky Way's glowing band in a dark sky. "This study shows that some insects can use the starry sky for orientation, even though they might not necessarily be able to discriminate the individual stars," the researchers wrote. "In theory, insects could use any large and dense group of bright stars for orientation or nocturnal migration." Scientists have long suspected that celestial orientation is used by still more species, ranging from moths and spiders to newts and frogs. This latest batch of meticulous experiments with poop-rolling beetles may well point the way to confirming those suspicions. 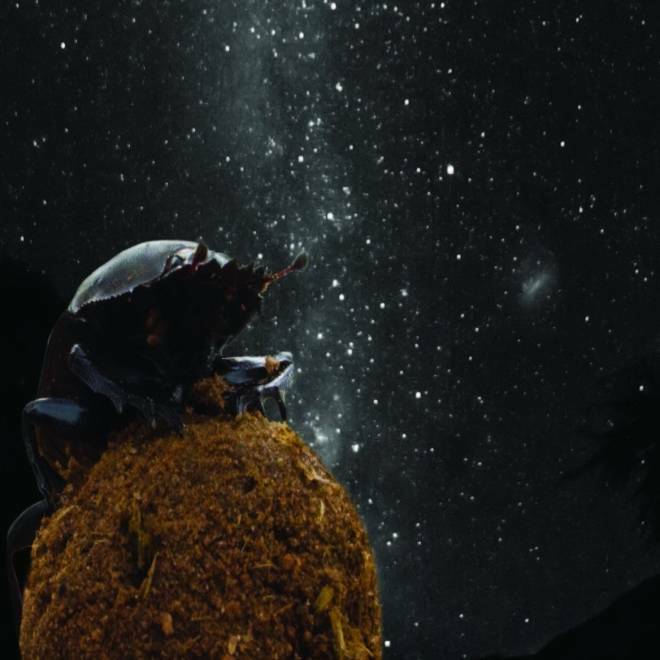 In addition to Dacke and Byrne, the authors of "Dung Beetles Use the Milky Way for Orientation" include Emily Baird, Clarke H. Scholtz and Eric J. Warrant.